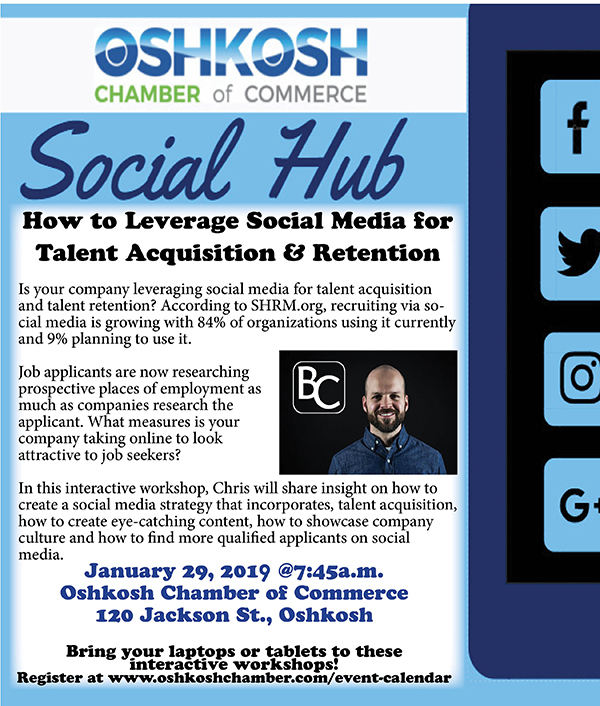 Join us for Social Hub presented by Chris Burns, Business Development Director at BConnected, LLC. Is your company leveraging social media for talent acquisition and talent retention? According to SHRM.org, recruiting via social media is growing with 84% of organizations using it currently and 9% planning to use it. Job applicants are now researching prospective places of employment as much as companies research the applicant. What measures is your company taking online to look attractive to job seekers? Companies of any size can benefit from this presentation and everyone is welcome. Levels of topics presented during Social Hub Sessions: beginner, intermediate, advanced. *This session is perfect for beginner to intermediate. We encourage you to bring your laptop or tablet to this free interactive workshop. Must register. Seating is limited to 20 attendees.